Be the first to answer, and you could win an SPU sweatshirt! Contact us at spu.edu/response or response@spu.edu with your answer. The late Lydia Flesher Green, former missionary to China and longtime nursing administrator, remains very much alive in Response readers’ memories  and her name lives on today in the Lydia Green Nursing Program for undergraduates in SPU’s School of Health Sciences. A record number of readers wrote in to identify Nurse Green, including our contest winner, Janet Tucker Jamison ’58. “She was a great encourager for me as I was preparing for foreign missionary service, a strong promoter, and a spiritual leader,” writes Lois Biddulph Ogan ’56. Read more remembrances of Lydia Green. Do you recognize the groundbreaking? 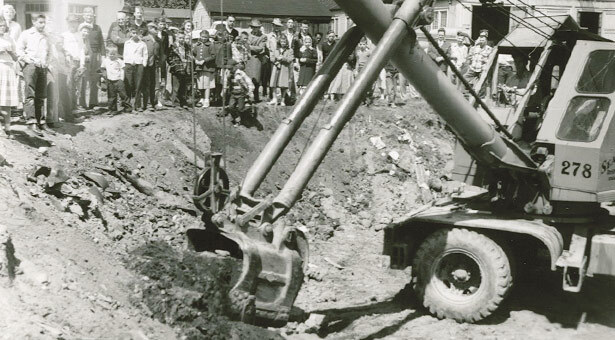 Be the first to identify the building that eventually stood after the groundbreaking shown in the top photo, and you could win an SPU sweatshirt!